This article will show you how you can create or perform insert, update and delete, select, drop and create table operation in an sql server database. Some of my previous articles are as follows: Bind and Validate GridView TextBox Value by jQuery In Asp.Net Using C#, Asp.Net Login Form With User Role Selection By Dropdownlist In Asp.net Using C#.Net, Populate Data in GridView on DropdownList Selected Role in Asp.net Using C#.net, Add Select text in Dropdownlist in Asp.Net OR Adding Default Select Option in the DropDownList Using C#.Net in Asp.Net, Search and Display Data In GridView From Database Table In Asp.Net Using C#.Net, How to Bind Data to Webgrid in ASP.net MVC Using C#.Net. So for this article first we will create a table in sql server database. 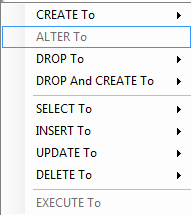 Now we will create the template for the insert, update and delete query. For creating query check the path. After this you will get below mention menu for Select, Insert, Update and delete. Now select one of the option and generate the query for that table.